The spellbinding ​Spiti Valley, located in Himachal Pradesh in India, is often proclaimed by those who see it as a world within a world. With an average height of around 12,500 feet above sea level, it consists of stark high-altitude alpine land. This is scattered with small villages and monasteries, and enclosed by soaring peaks crowned with snow. When coming from Manali via Kunzum Pass, Losar is the first major village that's encountered. The final stretch to Kaza, the administrative center of the Spiti Valley, follows the Spiti River. 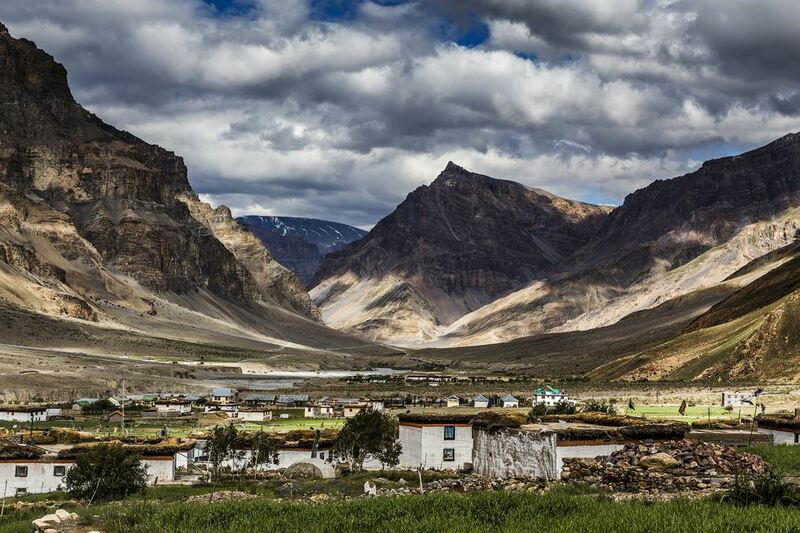 Explore the Spiti Valley by taking a visual tour in this Spiti photo gallery. Continue to 2 of 20 below. Ki Monastery, founded in the 16th century, is the biggest and most accessible of all the monasteries in Spiti. It's located only a short drive from Kaza, on the way to the village of Kibber. Continue to 3 of 20 below. Inside, the monastery has three floors with the first one underground and used mainly for storage. The other floors feature a ​collection of ancient murals and books. Continue to 4 of 20 below. Kibber, at an altitude of 14,200 feet above sea level, was once the highest village with a motorable road and electricity in the world. It's located about an hour from Kaza. Continue to 5 of 20 below. When you approach the village of Kibber, Buddhist chortens line the road into the village. Continue to 6 of 20 below. Kibber is possibly the most popular village in Spiti. It attracts numerous backpackers who hang out at the guest houses there. The Norling Guest House is the place to be. Continue to 7 of 20 below. The village of Kibber sits close to the Himalayan Mountains. Continue to 8 of 20 below. Jangchub Choeling Monastery is home to Kibber's local deity. Continue to 9 of 20 below. The defining feature of tiny Langza village is the towering Buddha statue on the mountain top in the background. The village is also renowned for its abundance of fossils. There are basic village homestays for travelers. Continue to 10 of 20 below. This striking huge Buddha statue presides over the village of Langza. Continue to 11 of 20 below. Farming is the main source of income for villagers in Spiti. Continue to 12 of 20 below. At a breathtaking (literally!) altitude of 15,049 feet above sea level, Komic Monastery is the highest monastery in Spiti. Continue to 13 of 20 below. Komic is the highest village in Asia. Continue to 14 of 20 below. Every Spiti village has at least a few yaks. They are such quirky, stocky, and yet powerful creatures. Some yak work safaris in Spiti and take travelers from Komic to Demul villages. Continue to 15 of 20 below. Houses in Spiti are typically made out of mud and wood, both of which provide quality insulation. Continue to 16 of 20 below. Buddhist monks are known for playing Tibetan instruments in the Demul village of Spiti. Continue to 17 of 20 below. The village of Dhankar is located between Kaza and Tabo. Dhang means "cliff" and kar means "fort." Dhankar translates to a fort on a cliff. As well as fort ruins, Dhankar has a monastery built on the towering spur overlooking the confluence of the Spiti and Pin rivers. Continue to 18 of 20 below. Also mesmerizing, Dhankar has a serene lake in the hills above the village. Continue to 19 of 20 below. The village of Tabo is home to a monastery that was founded in A.D. 996 AD. It is claimed to be the oldest continuously functioning Buddhist monastery in India. Continue to 20 of 20 below. Found in the Tabo village, stupas are sphere-like structures where people gather for meditation.